Stuttgart. After the great success of the model car series of the Mercedes-AMG G 63 Colour Package (Code: 01), Mercedes-Benz now brings out a limited edition of the G 500 4×4² in eight distinctive special colours. With portal axles and a full 44 centimetres of ground clearance, the G 500 4×4² has been the highlight in the model program of the off-road icon since 2015. Even scaled down to 1:18, the extreme G has an imposing appearance. 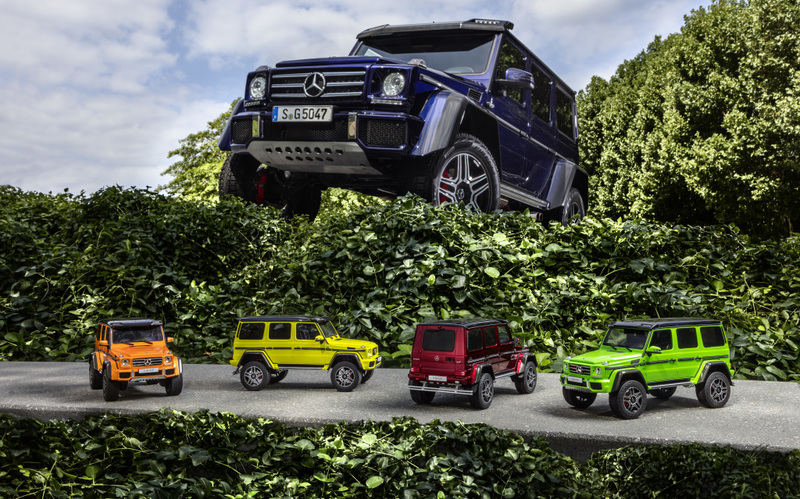 The G 500 4×4² is now available as a limited edition model car in the eight special colours; diamond white, electric beam, tektite grey, mauritius blue, sunset beam, alien green, tomato red and galactic beam. In line with the internal model code W 463, there are be exactly 463 copies of every colour – each numbered, i.e., “1 of 463”, “2 of 463”, etc., on the bottom of the each car. The exclusive, resin-made miniatures were created in collaboration with the model car specialist GT Spirit, who Mercedes-Benz gave the original design data to for the development of these unique models. The level of detail is extremely high: for example, the 4×4² logo on the rim was implemented as true to the original vehicle as the perforated metal under the front apron. The eight miniature extreme G models consist of up to 100 parts and are outfitted with a number of special equipment.